Four pieces of art have been unveiled by world-renowned Yorkshire-based artist Mackenzie Thorpe to celebrate the 2019 Tour de Yorkshire. Mackenzie, who hails from Middlesbrough, is one of the biggest-selling British artists of the last 30 years. He was confirmed as the official Tour de Yorkshire artist for 2019 when the full route for the fifth edition – which takes place between 2-5 May – was announced back in December. Famed for his atmospheric and poignant creations, Mackenzie’s work is ‘true to his working-class roots and packed with emotional expression which speaks of hope, love, struggle and challenge’. According to the event organising team, these are values which align with the spirit of the Tour de Yorkshire. 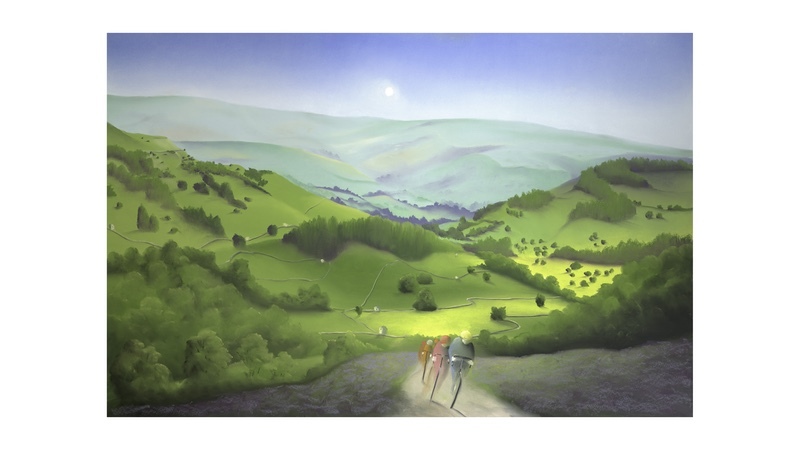 The four works, entitled Yorkshire Coast, Over Moor and Dale, Riding with Grandad and The Boy Without a Bike, were exclusively revealed at Arthaus Gallery in Richmond, North Yorkshire, which was established by Mackenzie in 1989. Speaking at the launch of the artworks, Mackenzie Thorpe said “I’m absolutely thrilled and honoured to be the official artist for the Tour de Yorkshire. For me the whole county is a never-ending inspiration; the dramatic skies, the dales and the moors are like nowhere I have ever been. “When I was thinking about the images, I knew I wanted to create a collection which also reflected the broader impact the race has on people. So, alongside images of peak fitness cyclists speeding through our glorious hills, dales and coast, there is (for instance) ‘Riding with Grandad’ which shows a child in a Yorkshire town, learning to ride a bicycle, aided by their grandfather. The Tour de Yorkshire was launched in 2015 as a legacy of Yorkshire’s 2014 Grand Départ for the Tour de France. It is organised by Welcome to Yorkshire and the Amaury Sport Organisation (A.S.O.). The men’s race holds a 2.HC UCI Europe Tour classification. The Asda Tour de Yorkshire Women’s Race was awarded 2.1 status in 2016. 2.6 million spectators lined the route for the 2018 edition, up from 2.2 million in 2017. The 2018 edition was watched by 12.5 million TV viewers in 190 countries. It generated a reported £98 million for the Yorkshire economy. The race is supported by Yorkshire Bank, Yorkshire Bank Bike Libraries, Asda, LNER, Dimension Data, Le Coq Sportif, Mavic, Tissot, Named Sport, Mug Shot, Soreen, Gateley PLC, Sky Betting & Gaming, Black Sheep and Global.